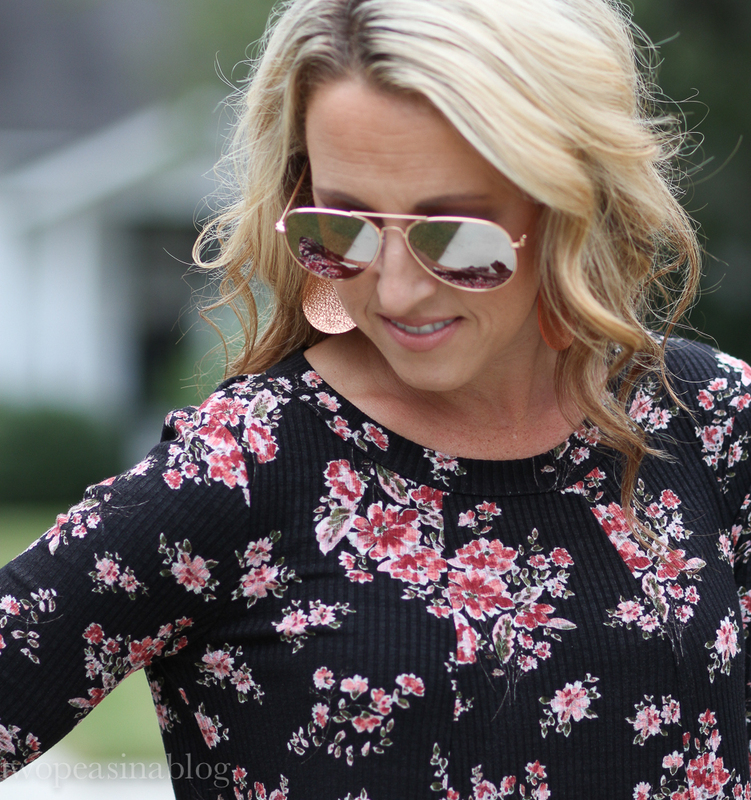 Another simple floral dress that is a must for Fall. I know everyone's weather is all over the place right now. One day it's over 90* then the next it's in the 70's. It's crazy, and super hard to dress for. This is a look that will work for both! I love swing dresses in the Fall paired with booties. I think it's just a perfect combo! This cute little dress has great texture with it's thin rib-knit. It also is available in a navy paisley print, black and olive, all for under $50!! Did you see the back? Too cute! On a lighter note, I've switched out my favorite Summer white nail polish for Fall colors. I've been getting a brown/burgundy gel color on my nails. I'm not sure of the exact color because it's an SNS gel powder I get at the nail salon. And I've been paining my toe nails black which I actually really like!! I've seen a couple ladies on Instagram who have painted their nails a beautiful olive green. I think I might try that next!! What colors are you using for Fall? This week's feature blogger is Rachael from Threads for Thomas. We love her early Fall outfit of white denim and light grey!!! Its such a great light, neutral look. Make sure you check out her blog for more style inspiration!! You're so pretty!! Love that dress and it's perfect because you can throw tights and a jacket on when it gets colder. I have those peep toes in black and love them so much. Andrea, thanks for your sweet comments!!! They are great booties aren't they??! This looks great on you! I'm loving booties to help transition to Fall, like you we are all over the place with the weather, currently we're rocking 100+ degree weather, boo! Come on FALL! Yes, the weather is all over the place here in Toronto, too! love the booties with the dress - great look!! Such a gorgeous fall dress! Love it with the booties! Such a beautiful dress and love it with the booties! I don't own a floral dress but I'm seeing them everywhere, so I might have to give one a try. Your floral dress looks pretty and I love your peep toe boots! 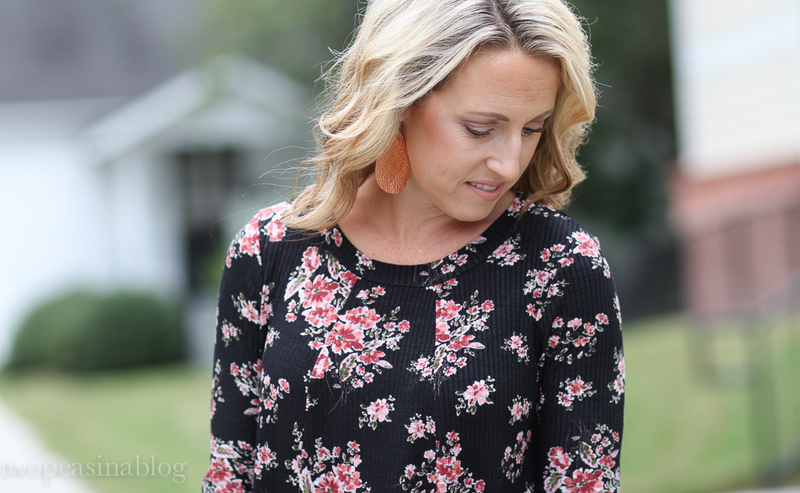 I love dark florals for fall, and that dress is fantastic! I just bought some burgundy polish and I need to get on painting my nails--the bottle is just sitting there right now! Such a pretty dark floral for fall! I just mentioned this great trend on my blog today! This is such a cute dress! I love the dark floral print! Gorgeous fall colours for this outfit! I love all your feminine dresses and tops. Love the dress! That will be so cute with leggings when it gets colder. Those are fabulous earrings too! Thank you for hosting the linkup!